This is your last chance for this year, the eleventh hour and then some. Great America’s Read to Succeed program is about to wrap up for another season. Now, if your child has not been reading they will have a difficult time meeting the requirements for this today, unless they REALLY like to read a lot at once. The basic program: read for 6 hours and earn a free Great America ticket. Read books, magazines, newspapers, comics, anything, just read! After they log a total of 360 minutes they earn the ticket. They have revamped this program and made it really easy to sign up for, which is great for procrastinators like me who just got around to signing up yesterday. We’ve been reading all along. We read tons as a matter of habit, but we had not actually filled out the information on their site. My early readers are always hungry for books at their level. Books that they can enjoy and not stumble through. Books a fitting length so they don’t get bored half way through. Books made for their little hands and big imaginations. We had the wonderful opportunity to review a set of books made just for kids getting started on the reading trail and my kids devoured them. Brooke and Nathan are in first grade and kindergarten and both are enjoying learning to read. Their progress has continued to soar this school year and I was excited to bring them some more books appropriate for their levels. In the few months we have had this, they actually both read through the entire four levels that we received, some with me and some independently. They both agreed that these were fun books to read. Details: We received the little reader books for sets 1-4 (91 books total), flashcards to go along with the sets, a placement and assessment manual, an instructor guide, and some charts and certificates for tracking and rewarding progress. Price: $160 for the four sets of books. They also sell for $30 each set. The flashcards are $15 for the set. Starts from the beginning. The first book of the first level starts with introducing four sounds and creating a story from there. After 26 little readers the child should have reached roughly the beginning of a first grade reading level. This is definitely designed to use with kids first starting to learn to read. As my kids have mastered this early level, we flew through the first set. Clear teacher guidance without being scripted. With an instructors’ guide book and lots of tips throughout the readers, parents can easily teach these books without a lot of prep work and without the dryness of a scripted reading program. Praise based. Throughout the program there are adorable little smiley faces to remind you to praise your child. I know, we all want to praise them and brag on them, but sometimes we are rushing through a lesson or trying to get things done and we forget. I love that these little reminders were there to keep me showering my kids with the praise they deserved for the excellent job they did as we read through the books. Steady progression. The books and stories within each book have a logical progression of sounds, and students easily flow from one to the other as their knowledge of reading grows with each turn of the page. Set one has one story per book with 20-100 words. In sets two and three the stories get a bit longer until in set four the students have two stories in each book and they are 200-400 words. But, by that point the kids are ready for it and reading roughly 60 words per minute. This is where the fluency criteria first appears. In the first sets they do not require speed, just mastery of the words. Reasonable expectations of mastery. For a child to progress they must have mastery. The program gives clear criteria for mastery of each level and help you know when a child is really ready for the next step. They give accuracy and fluency standards. This was great because even though my kindergartner could read without errors, he was a little slower than their standard at one point. So, we took a little break, and reread a few books while his fluency caught up with his phonemic awareness. Before long he was back on track, and as I mentioned he did finish all the books through level four landing him at roughly a late first or early second grade reading level. Lots of pieces. Of course, since the books are so appropriately sized, there are lots of them. This program does have a lot of pieces to keep together. I would definitely recommend a basket or bin to keep the items together. This is the kind of product I love to use, but will not be able to find all the books a year from now unless they have a handy home. Might need supplementation for the kinesthetic learner. Both my early readers are pretty easy to teach, but I have had others that were not that way. If you have a child that needs to wiggle more you might need to add some activities that keep them up and moving now and then to focus when they need to. As my kids are both enjoying reading it did not require any leg pulling to get them to pick these books up and read. 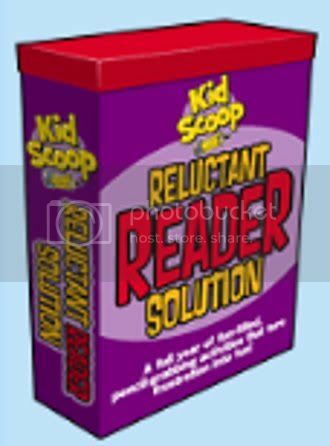 This program is well thought out and formulated for reading success. With pre-reading, post-reading, and periodic assessments, I see this being a great fit for most kids learning to read. It teaches various reading tips in a natural way within the context of stories, not meaningless exercises. Keeping kids reading, it definitely did that in our house. Disclaimer: This product was provided to me free of charge through Academic Success for All Learners as part of my participation in The Old Schoolhouse Homeschool Crew. I received no additional compensation and the opinions expressed here come from my personal experiences and sincere thoughts. We have read to our children since before they were born. We have books in pretty much every room of the house, with the exception of the laundry room (although with as much time as I spend in there, maybe I should change that). I love to read for fun and learning. So, it would follow naturally that my kids would all be voracious readers and share my love for books. Right? One of my kids just recently latched on to the Narnia series and has not stopped reading since. Aside from that, my first grader and kindergartner put the older kids to shame. The young ones do love to read. They are what I thought was supposed to happen in terms of reading success. When a product came along pledging to transform my reluctant readers I figured it was definitely worth a look. Details: A downloadable product with 365 pages. Each page contains activities and ideas for encouraging reluctant readers. Price: $97 for the downnloadable product and 12 month access to their online newspaper that comes with even more ideas and activities each month. Diversity of materials, activities, and topics. There is no true one size fits all product when it comes to reading, so they packed an incredibly diverse group of topics into this product. Everything from animals and the environment to baseball and optical illusions, bugs and budgeting to mini golf and just about every holiday on the calendar. Shows us that reading is everywhere. Building off of the daily newspaper, Kid Scoop has created loads of activities to get kids reading, skimming, searching, researching, and in general digging in to reading material. I think the hook for us was that this wasn’t just reading to enjoy a story (which for some reason my oldest does not enjoy), it was reading for fun, for a game, for some friendly competition. Free daily emails for a month. Anyone can sign up for their activity of the day email on their website and receive an activity email. We had lots of fun with these daily tasks. 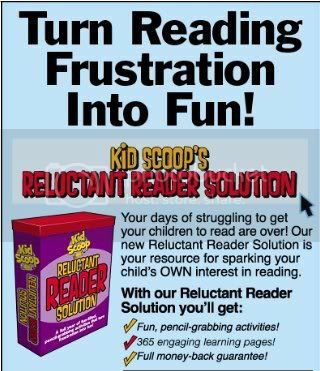 They will also give you a sample of some of the simpler ideas you will find in the Reluctant Reader Solution. Free online sample. On the page with their activity packs you will find a free sample that you can download. You will probably have some fun with this, so be prepared to set aside some time to get distracted with learning. Use it again, and again, and again. Since this is a download, after you get it, it’s yours. Print and reprint as much as you want. Print a copy for each of your kids. Print more copies of pages they want to do again. Print a page for you and your child and race to see who finishes first. When you aren’t just restricted to one copy of each page, the possibilities expand. Time tested. Kid Scoop has been around for a number of years. Sections of it appear in newspapers world wide. Kids love it, parents love it, educators love it. It has been well received in a variety of homes and cultures. Gets kids into the newspaper. Because many of the activities build off of the real newspaper, kids get into reading it. Some of my kids already have an interest in the paper, but this was a fun way to get them searching through it even more. I want them to be comfortable with this print medium that has been around for a long time and doesn’t look to be going away soon. One of the goals of Kid Scoop is that kids will get to know their daily paper, the terms used and the parts of it. They definitely work to intentionally reach that goal. I actually felt like it was light on the reading. While their focus is the reluctant reader so it makes sense that they keep reading unintimidating, I felt like kids could get through many of the activities without really reading much. Some of my kids are experts in figuring out how to complete a task without actually doing any reading. I had to keep on top of that. Helpful if you subscribe to a print newspaper, but not essential. Many of the activities can best work with a printed newspaper in hand. They also include a wide variety of activities to use the newspaper before recycling it, so it will be put to good use. For many of these activities you could merely read a paper online, but a print one would be easier in some cases. Some will flop. While the diversity of materials is quite a plus, some of it will not appeal to some kids. They will more than likely all find something they enjoy, but they will also more than likely find something you have to drag them through, which kind of defeats the purpose. Secular. Just be aware that their holiday sections focus on the holidays, not any spiritual meaning behind them. So, Easter is all about bunnies and eggs. This is another reason that I would be more likely to pick and choose and buy activity packs rather than purchasing the whole set. A bit pricey. Yeah, I could buy a lot of workbooks for $100. And, since there were topics in here that I know we would not likely use, I might be more inclined to buy their separate little ebooks or activity packs that they offer on their site for just a few bucks each. This product did definitely fill a lull in our days and prompt reading where none existed before. When I needed a little something fun that would not require an hour of planning on my part, we could pull out a little unit and find multiple activities with something that appealed to almost everyone. In the process we learned. Not just playing around and having fun together, although that was part of it, but really learning something new. Learning how our eyes work, new vocabulary words, craft ideas, trivia and history, and other facts and data to keep stimulating my kids minds. And, whether they noticed or not, a lot of reading got snuck in in the process. Disclaimer: This product was provided to me free of charge through Kid Scoop as part of my participation in The Old Schoolhouse Homeschool Crew. I received no additional compensation and the opinions expressed here come from my personal experiences and sincere thoughts. For more information about the program please mail, fax or e-mail your request to the address, fax number or e-mail address below. She warns against twaddle, a word I just love. So, I have started a vigilant hunt for books that breathe. We read living books because we love them, they bring us together. They prompt incredible conversations. Even my little ones surprise me with the observations that they make about a book and its connections with real life. They bring something to our home school that no unit study, hands-on project, or even a field trip can. They spark the imagination and make creativity soar. Some look alive, but hold nothing of value beyond the front cover. Others look old and dry and yet have carried us on amazing adventures. How do I know? Where do I find a good book? Ambleside Online — This website builds directly off of the Charlotte Mason philsophy. It assigns a time period for each year and can and is used by many as the core of their homeschool. We used them loosely for a couple years. Now, I still refer to that site because the book lists are excellent. We have loved probably 90% of the books we found through that site. Curriculum reading lists — I started looking through other curriculums (like Sonlight — which we also used for a year) to see what books they recommend at various grade levels. Lots of great recommendations made it into our reading list this way as well. Five in a Row — For books and accompanying activities, these books can give you plenty to choose from. Books that have stood the test of time, and you will love reading and rereading with your kids. The Book Guardians — This is a brand new site for which I will be a contributor. Be sure to check it out over time as more books get added to its ranks. It will list books and share in 10 key areas if they have content that might need consideration. I talked more about it on my blog post about book reviews. Common Sense Media — This site offers a number of reviews, but does not seem to have a strong moral slant. I did not find the reviews as helpful because I tend to have a stricter standard on what I deem appropriate reading for my kids. Still, definitely some value in the sheer quantity of books they have reviewed. Christian Children’s book reviews –A good site, but seems to review only Christian books. Focus on the Family has a book review section — Some good reviews, but they seemed to be lacking a depth in their recommendations and information provided. Does come from a conservative preference morally. Facts on Fiction — Lots of reviews and clearly targeting key areas of concern. Alphabetized and easy to find what you are looking for. 1000 Good books — compiled by 25 homeschool moms, you can find 1000 of their recommendations. That should keep you busy for a while! With six kids, five of them now school age, the trick is finding time in a day to read books. We have employed a variety of means to do so. We read a bit each day. Sometimes at bedtime, sometimes in the afternoon. We have a silent reading time each day as well. Books on CD also help. We listen to these in our rooms, at bedtime, and definitely in the car. We “read” an extra book or two each month by listening in the car. And, it keeps the kiddos quiet while we travel! And, every year we discover a few more favorites. Stay tuned to hear what we unearth this year. Please add some more resources or book favorites of your own in the comments. We are always looking for well loved books. It’s Time Again to Reserve Your 2010-11 BOOK IT! Materials. This year you must enroll your individual family, they are not accepting submissions from groups. It’s a very simple process though, so jump online and get signed up. You should receive the materials around the beginning of September and you can begin setting and rewarding reading goals with your child(ren) in October. Easy to use and a simple motivator for kids that need an extra nudge to get their nose in a book, or a great reward for those that are already reading up a storm. The enrollment period is from March 1 through June 30, 2010. Orders beyond these dates will be filled as supplies allow on a first-come first-served basis. 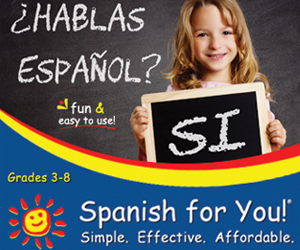 Looking for Phonics tutoring for your child? Betty Davis, published author of How Jill Learned to Read Using Phonics and educator for more than ten years is offering resources and classes to children aged four through twelve in reading and writing. You may check out her website at Funn with Phonics Tutoring. She has designed this program that walk children through three main levels of reading mastery. Students will clap , march, and sing as they learn the sounds of the alphabet. Art and other forms of media is used to support the phonics concept that is being taught that week. Each week students’ are taught a new word family that is associated with a particular short vowel. For students who are familiar with the word families associated with level one, level 2 focus on learning blends, while level three focuses on long vowels, digraphs, and diphthongs. Based in McHenry County, Betty is available to meet at public libraries throughout the Northwest Suburbs. A couple years ago I heard about a history text that caught my attention. It focused on not just the important events and people of history, but God’s working through it all, and from a biblical perspective. I kept an eye out for it at used book sales (my main avenue for accumulating new curriculum), but it never reared its cover. No wonder. I have no desire to let go of this book either, and will move Volumes I and II closer to the top of my “Buy for homeschool” list. It brings us all together to study one history, from the kindergartener to the middle schooler. I love things we do all together, and the kids learn even more from each other, even their younger siblings. Details: This full color history text offers 84 lessons beginning in the Renaissance and ending in early American history. Scriptural basis. The book clearly looks at history and historical figures from a Christian viewpoint. The title tells it all, history is His story. Adaptable for a variety of ages. Although a bit above me four year old, my five year old will listen along and grasp the basics of what we have read and discussed. Activities are varied for the different ages as well. Related activity ideas. Some projects get a little involved, but lots of creativity and greater in depth study comes out of these extra tasks. The book is very high quality. Beautiful pictures, sturdy cover and pages, well written, interesting to read, and just overall impressive just to look at. Pretest quizzes to see what we already know (which was generally nothing . . . ) While these asked questions that were a bit specific (e.g. True/False: Columbus returned to the New World with 17 ships on his second voyage), it showed us how much we had to learn, and got us excited about the chapter ahead. Challenges we faced . . . Some of the daily readings ran a little long. I probably could have split them up into a couple days, but they are well written and engaging, so it was hard to just stop in the middle and pick up another time. As great as the book is with its wonderful pictures, there were times they talked about a person or place and I thought, “Where’s the picture?” Thanks to the internet, we could of course find our own, but I did feel there were some gaps in that regard in the printed material. I have no hesitation in recommending this product to anyone looking for a Christian based history curriculum that can work for a variety of ages. I definitely plan on purchasing more Mystery of History books after our experience with this one. Whether used exclusively or to supplement other secular sources, this book deserves a place on your home book shelf. Disclaimer: This curriculum was provided to me free of charge from Bright Ideas Press as part of my participation in The Old Schoolhouse Homeschool Crew. I received no additional compensation and the opinions expressed here come from my personal experiences and sincere thoughts. Here is information on a great reading incentive program that is open to homeschoolers as well. Students Kindergarten through eighth grade may participate and earn a free ticket to the Cougar’s game in the spring. Ozzie’s Reading Club is an eight-week reading incentive program sponsored by the Kane County Cougars along with Provena Mercy Medical Center. The program is open to children in grades K-8; however, to participate, a student’s school must be a member of the Ozzie’s Reading Club program. Ozzie’s Reading Club tracks the progress of a student’s reading around the bases of a baseball diamond with the three bases and home plate representing two weeks worth of reading. Each teacher may determine his or her own reading requirements for each base. Students completing the program’s requirements “hit a home run” and earn a free ticket to an April or May Cougars game designated by their school. Other rewards may include a bookmark, a voucher for a hot dog and soda as well as an official Ozzie Reading Club t-shirt.